We have already brought several Apps and features ports from the remarkable Galaxy S7 and S7 Edge TouchWiz firmware. For instance, the stock Galaxy S7 wallpapers, stock S7 Ringtones, UI tones, S7 Apps port for the Note 5 and Galaxy S6 variants , ROM port for the same, and of course the full firmware files. So here we are with the official stock Samsung galaxy S7 & S7 Edge apps and ports for the Note 4 device running on Android 6.0.1 Marshmallow firmware. These apps have been tested working on stock Samsung TouchWiz Android 6.0.1 by many Samsung users and not on Lollipop firmware. Some apps listed here are APK files and can be installed directly using the default application installer. However, some app ports listed here need to replace the stock application files from the location system/priv-app and provide suitable permissions which may or may not require root access. So if you can reach the apps then you don’t require root access. Just follow the instructions associated with the download links below and you will be fine. you will need to be. Moreover, some of the features listed in this tutorial require a TWRP recovery flash. So just check out the description just below the download links for each app. Here you will see how to download and install Galaxy S7 stock Apps and features. Fortunately, some Samsung devices already have the latest TWRP and root available using CF Auto Root. So that would not be a problem. Here are some Apps and features that can be ported to your devices and turn it close to the stunning Galaxy S7 device: S7 Music, S7 Voice, S7 Calculator, S7 Contacts, S7 INCALL UI, S7 Memo, S7 ClockPackage & ToucWizHome, S7 Theme Store, S7 SPlanner, S7 Galaxy Apps, S7 SHealth, S7 S Voice, S7 Wallpaper Cropper, S7 Easy Launcher, S7 Galaxy Care, S7 Samsung Pay, S7 Galaxy Labs, S7 Wallpaper Picker. Check out the screen shots from our Pinterest board for the Note 5 and S6 port. Before you proceed, take a note that you will need to replace the stock firmware apps with the new one listed below and set correct permissions. Hence, backup and take a look at the brief tutorial below. Featured Ports. Here are dedicated posts for the S7 Apps and features port that go along with all the Samsung devices. How to Port S7 Apps and Set Correct Permissions? For people who gets SPlanner FC, follow these steps carefully. 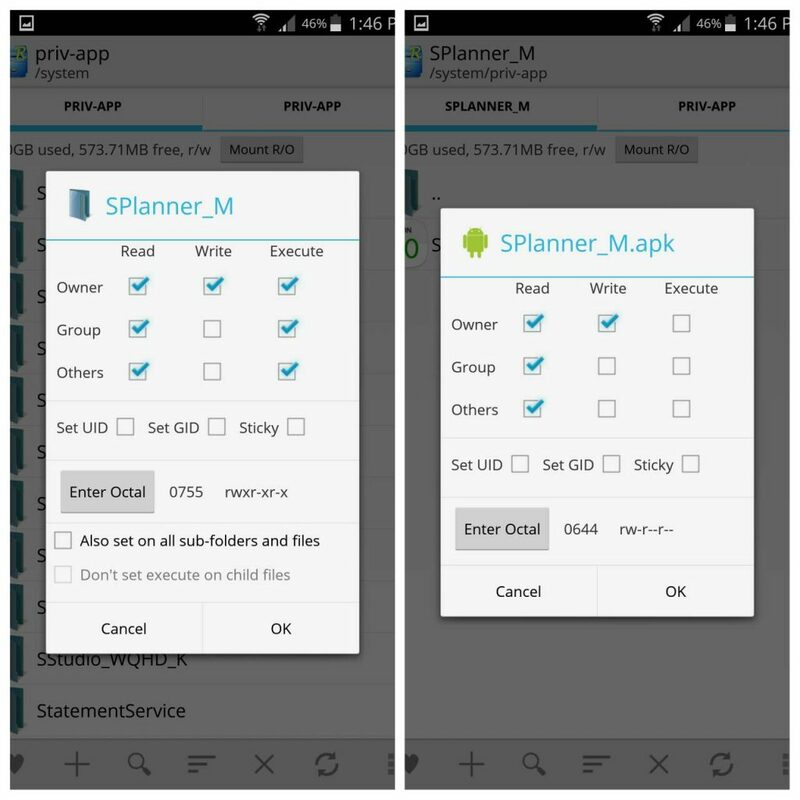 Delete “SPlanner_M_OS_UPG” and “SPlannerWidget_M_OS_UPG_Transparent” from system/app. Also, backup. that means create a copy. You may or may not enter bootloop. If you do, Reboot to recovery, wipe cache & dalvik cache and reboot. Set the permission as shown in the picture. The first permission is for folder, and the other is for apps and files. Things to noted that DPI is 560 in build.prop. Not sure whether it affects or not. Follow and share us on social media. Comment down below if you have any queries. Check out other cool stuff about Samsung Galaxy S7 from this thread. Now that Android Marshmallow 6.0.1 is being rolled out to the Galaxy Tab S 10.5 (SM-T800), would these instructions work to port the S7 apps to the Tab S?